Cut off stems and snap off first few small leaves. Slice through tips, if desired. Trim dark green from bottom. Plunge into acidified water to prevent discoloration. Cook by preferred method. Drain. Separate leaves from bottom, discarding any purple or thorny center leaves; set aside. Remove fuzzy center from bottom; set aside. Trim sweet anise; slice thinly. Combine olive oil and lemon juice in a non-reactive pan. Braise sweet anise, tightly covered, over low heat, stirring occasionally, until very tender for about 30 minutes. Arrange prepared artichoke bottoms on top of braising sweet anise. Cover; heat artichokes through, about 5 to 10 minutes. Add a tablespoon of water, as needed to keep food moist. Remove artichoke bottoms from pan. Hold warm. In a food processor or blender, puree the cooked sweet anise, chick peas, salt, pepper, and cayenne. Fill center of cooked artichoke bottom with a few tablespoons of the chick pea puree. 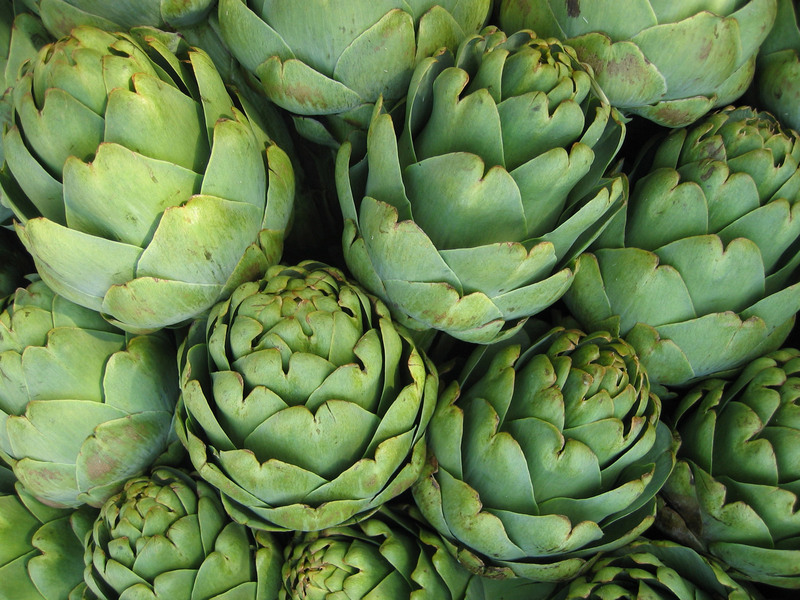 Arrange cooked artichoke leaves around center.